Every team has a captain; someone to analyze the facts, gather input from his players, and create a game plan of attack. Thankfully, Cody Matthews joined our ATC team in 2010, and became our “Team Quarterback”. 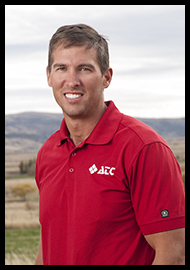 Cody oversees our Outside Plant facilities, and works closely with his team of technicians to maintain, build, and expand our growing network. Cody loves the challenge of engineering, getting his hands dirty in construction, and the classic peanut butter and honey sandwich. When he’s not buried in blue-prints or supervising our fiber builds, he can be found hunting, fishing and four-wheeling with his family and friends. We’re privileged to have this funky eye-colored quarterback calling the plays from our ATC huddle.